SANTA CLARITA, Calif. -- A tortoise trying to escape the Sand Fire in Santa Clarita was found along the street, fleeing as quickly as he could. 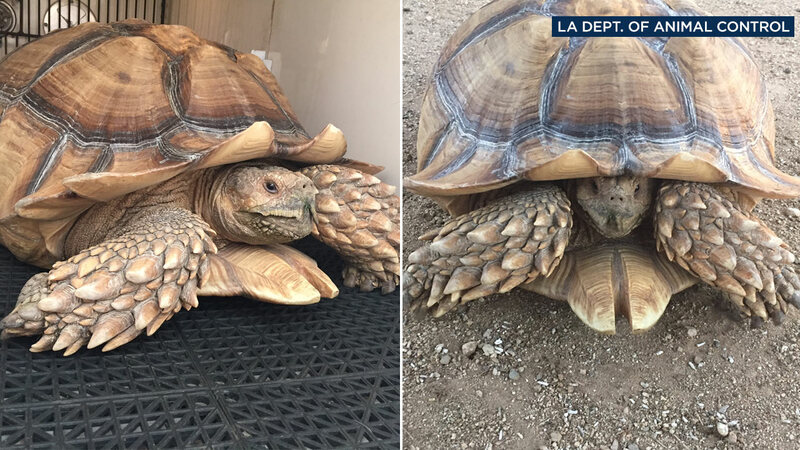 Officials with the County of Los Angeles Department of Animal Care and Control picked up the tortoise, which weighs about 75 pounds. They took him to Castaic Animal Care Center. So if you are missing your pet tortoise, we're told he's resting comfortably at the care center. In addition to the tortoise, county animal control officials said they rounded up 228 horses, 52 goats, 29 chickens, seven rabbits, five cats and two dogs from the Castaic area. The Sand Fire erupted Friday afternoon and has since grown to 22,000 acres. Eighteen homes have been destroyed, and 1,500 others have been evacuated.